Would 2 Goblin Rabblemasters make them both attack? 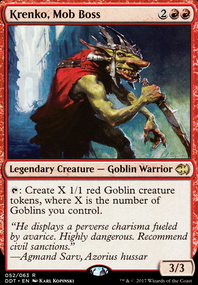 Does heir of the wilds have it's Ferocious ability triggered when attacking with a goblin rabblemaster and one or more goblins? 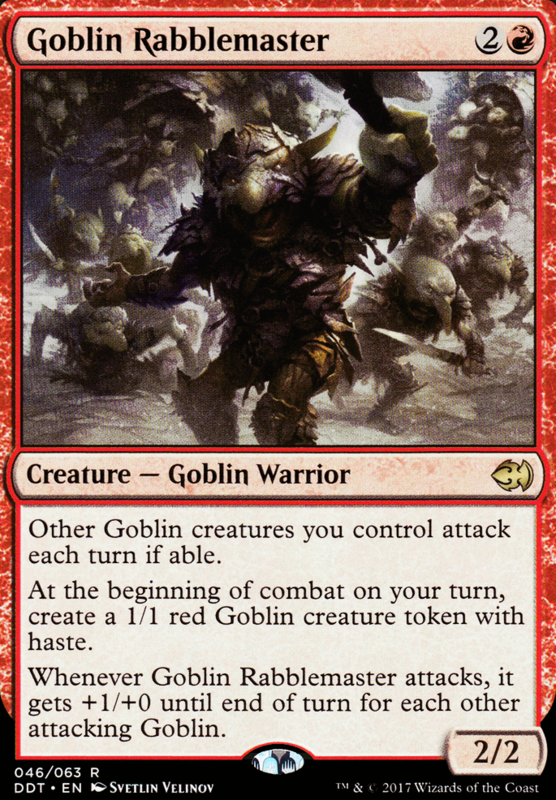 How does Goblin Rabblemaster attacking into a Circle of Flame work? Cavern of Souls will keep your guys from getting countered. Vanquisher's Banner provides some card draw, and Metallic Mimic makes the team bigger. Something like Door of Destinies or Stoneforge Masterwork could also be good. Oh, and Goblin Rabblemaster and Kiki-Jiki, Mirror Breaker are fun. Really good clocks go a long way. Goblin Rabblemaster is an option, although limited in other uses. 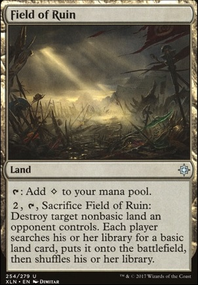 Land destruction is also really good. If you get them down before they get Tron online then they're basically time walk or better. Fulminator Mage and Field of Ruin are the best in my opinion. Stony Silence is also really good half the time. Hey there. I feel like there is a mixed focus here, with there being the whole aspect of life gain, while also burn. I think there has to be more of a commitment to one or the other. Soul sisters or burn. 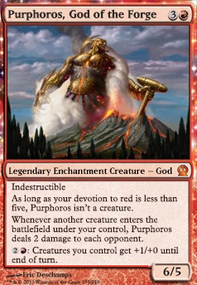 Because it's boros I'm going to assume you're going for more burn then life gain, so I'd probably contemplate removing the soul sister affect from the mainboard completely. Vexing Devil is a great one, procs impact tremors no matter what, and can do 1/5th of their starting life for 1 mana. Lightning Bolt is half the cost of Lightning Helix for the same damage, so it's definitely an incredible card. Mogg War Marshal is three creatures for 2, can't complain with that. Goblin Rabblemaster is a threat on his own while also creating tokens (a little slow maybe, could be sideboard for control or something though). I think Intangible Virtue is an interesting one, it could work if there is like 90% of creatures as tokens, but as it stands there are too many non-token creatures. It really has to be buffing at minimum 3 creatures to be of value. I might honestly take out the black and go for the faster route of cards such as Krenko's Command / Dragon Fodder type of cards. 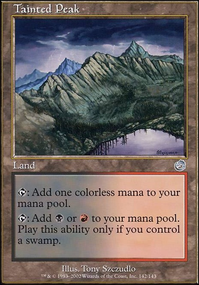 Also with taking out black it'll allow for easier mana base. Spectral Procession is also a littler harder to get off than Hordeling Outburst , if you're looking for an equivalent. 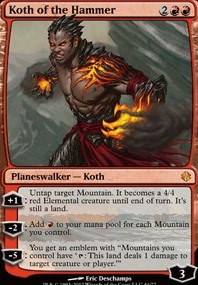 I'd also probably get rid of Path to Exile as it really only works better than Lightning Bolt or similar cards when you're dealing with something greater than 3 health, in which case you could even use Flame Slash if you'd like. But if you don't have enough tokens to attack and not care at that point it's probably a dangerous situation anyway. I hope some of my suggestions will be new/interesting ideas to you, and good luck! Hey, adding black to Goblins is good not just for Wort, but for adding a sacrifice and drain opponent life strategies. 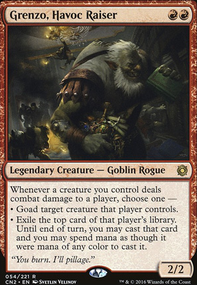 Zulaport Cutthroat , Blood Artist , Judith, the Scourge Diva , Goblin Bombardment , Skirk Prospector , Viscera Seer , Goblin Chirurgeon , Diabolic Intent , Siege-Gang Commander , etc. These strategies are also good with Goblin tokens with Krenko, Mob Boss , Goblin Rabblemaster , etc. goblins usually aren't a particularly hard matchup. you just gotta be able to remove their key goblins like Goblin Chieftain and Goblin Rabblemaster , and/or have some early blockers. instead of building an anti-goblin deck, you should post your current deck here so people can suggest upgrades to it that will help against the goblin matchup. if you build a deck specifically meant to counter one thing, its just more likely to lose against everything else.